White Spot (web site, map, 2518 West Broadway, Vancouver, BC, Canada, phone: 604-731-2434) is a successful Canadian restaurant chain that is famous for their burgers with “Triple-O sauce” and their milkshakes. 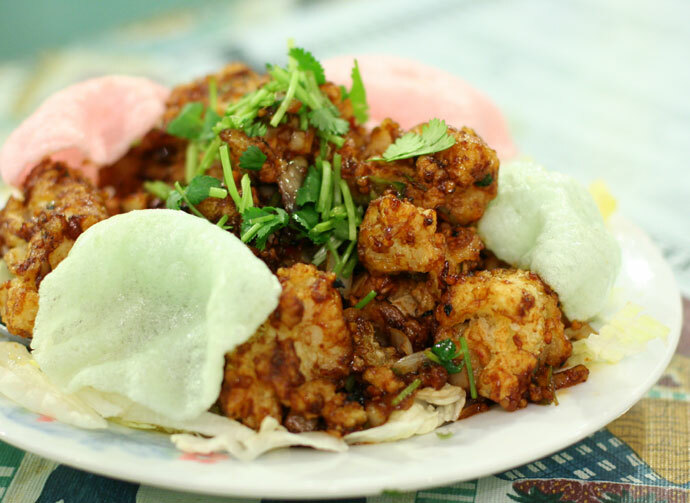 The restaurant has several locations around the Vancouver area, including the Kitsilano location (which I visited), Surrey and Delta, Richmond, Burnaby, Langley, Aldergrove, Coquitlam, and more (even Victoria and Naniamo too). View their web site for a list of their other locations. White Spot is a great place to go for a relaxing breakfast or brunch, or a casual dinner or lunch too. I had a gift certificate coupon that I had won in a 5k race, so was able to get one of their Legendary Burger Platters for free, which normally costs $8.99 (and comes with fries and coleslaw). My friend ate the burger platter with fries and I ordered another Legendary Burger platter with a Caesar Salad, which was $9.98 (pictured below). Yum! 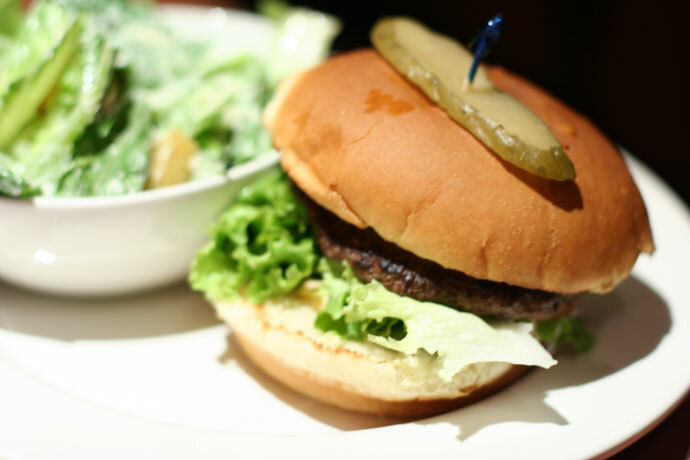 Be sure to ask for lettuce and tomato on your burger if you like it, as the toppings are no extra charge. For more photos from White Spot please view my previous reviews: Part 3 – BC Ferries, Part 2 – Salmon Burger, Part 1 – Chicken Gai Yang. Legendary Burger Platter (with Caesar salad, $9.98) from White Spot restaurant in Kitsilano, Vancouver, BC, Canada. Green Lettuce Restaurant (112- 6350 120th Street, Surrey, BC, Canada, phone 604-572-8677, at 120th Street and 64th Ave) is a Chinese – Indian fusion restaurant with a truly unique approach to the combination of these two cuisines, as reflected in the extensive menu full of remarkable and delicious dishes. First off this is the best Chinese/Indian restaurant out there. The food is amazing and always good! 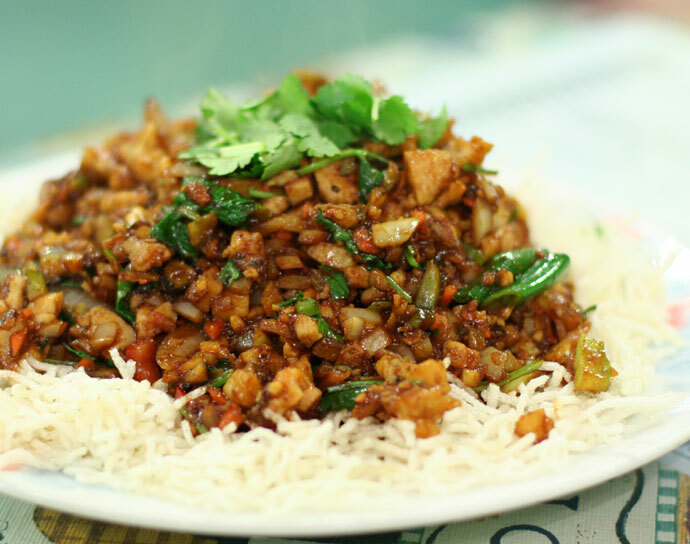 Being Indian, I love the authentic Indian taste with the Chinese twist. The menu is huge, and everything is worth a shot. 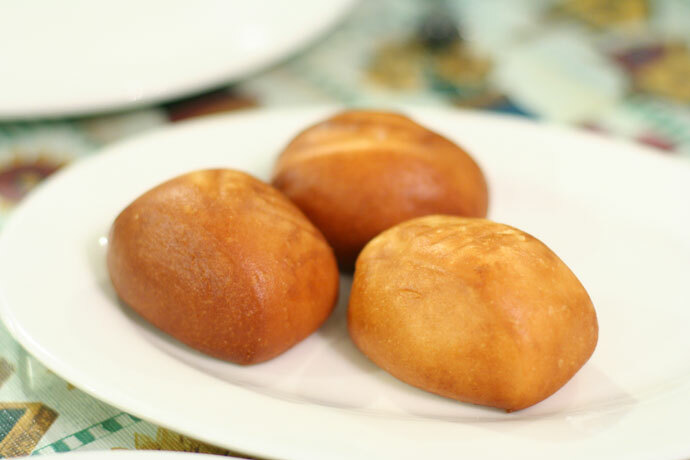 As an appetizer, we tried the Deep Fried Mini Buns (pictured below, $1.95). We also enjoyed the Green Lettuce Masala Wrap, which is like Chinese lettuce wrap with Indian spices, served with chutney sauce (also pictured below, $13.95). 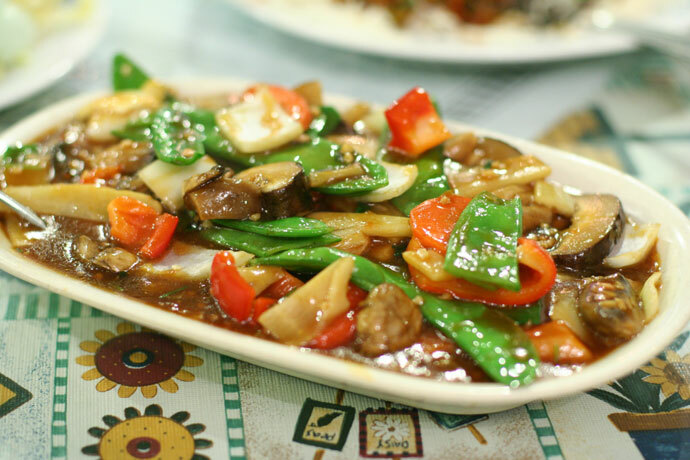 Other dishes we liked were the Hot and Spicy Squid (shown below, $14.50) and the Chinese stir fry vegetables (pictured below, $10.50). This restaurant is one of my all time favorite restaurants, mostly because of the unique and tasty way the dishes are spiced. The restaurant is also very popular for take-out orders for those lucky enough to live in the North Delta/ Surrey area. Masala Lettuce Wrap ($13.95) – also includes a head of lettuce. 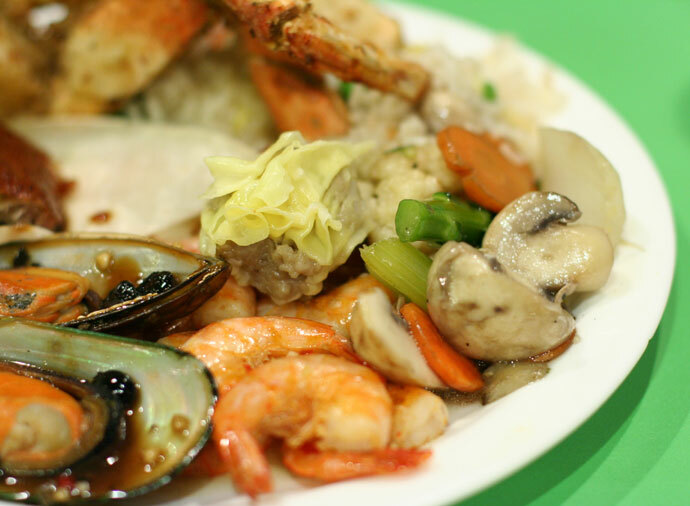 The Oriental Buffet near Guildford Shopping Mall (15140 – 101st Ave., Surrey, BC, phone 604-583-8893) is a huge all-you-can-eat restaurant that has a big selection of Chinese and Japanese items (some of which are pictured below). 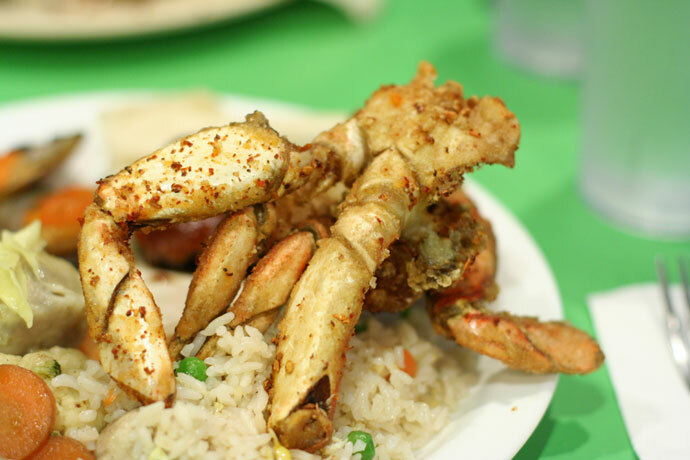 Be adventurous and try some Peking Duck on a crepe with hoi-sin sauce and green onion, or how about some Japanese sushi, Chinese dim-sum, deep fried crab legs (pictured below), or the old favorites such as barbecued pork or chicken, popcorn shrimp, mussels, sweet and sour, wonton soup – you name it!! Finish off with some icecream, cake, jello, or mango pudding for dessert. This restaurant is very popular with Chinese tour groups; the tour buses pull up and the high volume of customers keeps the food fresh. Dinner per person is a reasonable $14.99 plus tax; various alcoholic and non-alcoholic beverages are also available at an additional cost. View More Restaurants in the Surrey category. We hope you enjoy the great Surrey restaurants on Dine Out Here Vancouver.